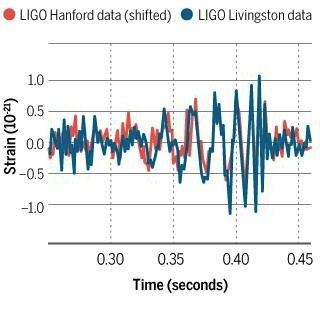 Signal from LIGO’s Washington observatory (red) shifted in time by 0.007 seconds makes a good match to the signal from LIGO’s Louisiana observatory (blue). Thanks to George Papado and Patricia Lagrange for notifying me of the initial news releases and to Pál Szabolcs for informing about the associated gamma ray burst. After sitting on their discovery for 5 months, scientists affiliated with the LIGO observatories finally announced that they had for the first time unequivocally detected a gravity wave. This culminated a four decade search for gravity waves. First, one may note that if our own Galactic center were ever to launch a killer gravity wave heralding a coming superwave, don’t expect to hear about it from LIGO. They will likely sit on the data for months and then you would never hear about it because all global communication systems would be down two days later after the gamma ray/cosmic ray pulse arrived. I entirely agree with Mr. Wallis. Theoretically, a black hole has all its mass concentrated at one point. So it seems that two black holes orbiting one another would have great difficulty merging. They would simply continue orbiting one another. Megamasses, or what I have called “Mother stars” would be entirely a different situation. Take for example Mother stars having masses of 29 Msolar and 36 Msolar. Given that a 2 solar mass neutron star is calculated to have a radius of 11 km, scaling this up, we may conclude that these more massive stars would have radii of about 27 km and 29 km respectively. Here we assume they have densities similar to a 2 solar mass neutron star. If they were to have greater densities similar to those theorized for quark stars, then their radii would be somewhat smaller, perhaps as small as 20 – 25 km. Since I don’t believe in the existence of quarks, 35 years ago I referred to these as hyperon stars, meaning that they would be composed of “hyperons”, neutral particles more massive than neutrons which had become stable within the depths of the hyperon star’s gravity well; see discussion in Subquantum Kinetics (SQK). As SQK predicts, stars of mass greater than the conventional 3 solar mass cut off would be unable to collapse into a black hole because of their enormous unlimited production of genic energy which would support their interior from collapse and which increases as stellar radius decreases thereby overpowering the inward pull of gravity. Besides, it has also been experimentally demonstrated that the electric potential at the center of a neutron plateaus, and the same would be true of the neutron’s gravity field by virtue of electrogravitic coupling. So as two neutrons are compressed increasingly close together, their mutual gravitational attraction should approach zero. Hence black holes should not be able to form. Moreover, as mentioned above, Einstein would have been in complete agreement on this point. But two orbiting masses having tangible radial dimensions of the order of 28 km would be far more likely to converge inward towards one another due to tidal dissipation effects. That is, tidal forces would deform these objects as they orbited one another and convert their orbital kinetic energy into heat, resulting in a progressive spiraling of one in towards the other. Actually, the simulation shown in the above video is a good representation of what might take place, provided one realizes that these spheres are Mother stars (or “Megamasses”) and not black holes. This quadruple oscillation would likely initiate the corresponding formation of quadrupole gravity waves, thus explaining the oscillations that LIGO detected. However, not all gravity waves would necessarily be quadrupolar. Just as it is possible to produce non polarized longitudinal electric wave pulses, also known as Tesla waves, it should also be possible for natural sources to produce longitudinal gravity wave pulses, gravity waves that initiate movement forward and backward in their direction of travel much like sound waves do. In fact, most of the gravity waves that are likely to be produced in Nature are likely to be of this sort which explains why LIGO has had such a hard time detecting them, their equipment being designed to instead detect quadrupole waves. For example, supernova explosions and galactic core outbursts would tend to produce longitudinal gravity waves since their initial energy outburst would move radially away from the exploding celestial source. Once the LIGO team finally made their results public after a 5 month period of secrecy, other groups of astronomers began to check for the possibility whether the gravity wave was associated with a gamma ray burst. In fact, they found it was, and this finding proved to be very embarrassing to the LIGO team who had attempted to explain their outburst as being due to the coalescence of two low mass black holes; see story in New Scientist: https://www.newscientist.com/article/2077783-ligos-black-holes-may-have-lived-and-died-inside-a-huge-star/. It turns out that NASA’s Fermi Gamma Ray Space Telescope detected a 1 second long gamma ray burst which began just 0.4 seconds after the arrival of LIGO’s gravity wave. The Fermi team calculated the probability of this being just a coincidence as just 0.0022, or one chance in 455; see paper posted at http://arxiv.org/abs/1602.03920. So, logic tells us that the two signals were related. They found that the gamma ray burst was determined to come from a region of the sky consistent with the general direction determined by LIGO. Figuring that the gravity wave source lay 1.3 billion light years away, as suggested by the LIGO team, then this 0.4 second delay would amount to an almost negligible speed difference, one part in 1017. It is significant that the gamma ray burst arrived after the gravity wave signal. This could have been due to two possibilities: a) the energy outburst immediately followed the mass oscillation event that generated the gravity wave pulse, or b) the EM signal of the gamma ray burst travelled slightly slower through space due to the slowing effect due to scattering by the interstellar medium. Most of this scattering likely would have occurred in the gas surrounding our Galaxy. But since this burst came from a high galactic latitude direction, it would have passed through a minimal amount of disc gas and hence had a minimal signal delay. This contrasts with the 2004 earthquake and gamma ray burst in which the burst was delayed by two days as compared with the time of the Malaysian earthquake/tidal wave. In this case, the burst originated from within our Galaxy and traveled outward through the galactic disc through regions having the greatest concentration of interstellar gas, hence resulting in far greater scattering for that event. But the discovery that a gamma ray burst was associated with this gravity wave turns out to be very embarrassing for the LIGO team which had proposed that the wave was produced by the coalescence of two low mass black holes. The reason is that astrophysicists generally agree that coalescing black holes should not produce any burst of EM radiation. The Fermi team estimates that the energy fluence of the gamma ray burst calculated to be in the range of 0.8 to 3 X 1049 erg/second in the 1 key – 10 Mev X-ray band. This amounts to about 7 X 1015 solar luminosities. This is more in line with the energy burst from the onset of a quasar-level galactic core explosion similar to that observed to come from quasar PDS 456: http://starburstfound.org/superwaveblog/?p=84. PDS 456 was observed to have an initial X-ray luminosity of 0.5 X 1049 erg/second, hence in the same range as that estimated for the above gamma ray burst. One member of the Fermi team acknowledged that what they saw could not be explained by coalescing black holes. Valerie Connaughton of the Fermi team, said: “Everything smells like a short gamma-ray burst in our signal, and that’s a real problem in a way – you don’t expect this signal from merging black holes.” (See New Scientist posting). In an attempt to find a way out of this dilemma, Avi Loeb of Harvard University suggested that a gamma ray burst could have resulted if the two orbiting black holes were enveloped in the belly of a very massive star, a few hundred times the mass of the Sun. He suggested that the merging of the black holes could then have triggered the collapse of the star which produced the gamma ray outburst. But then one might ask, even if black holes existed, which we already know they can’t for reasons stated above, what are the chances of two black holes forming inside of such a massive star. I think the answer is very unlikely. But, the nature of the dilemma drives the astrophysical community to propose such theories. The far more simple alternative is that the gravity wave was produced by the orbiting of two low mass mother stars, as I had suggested above, or the collision of a low mass mother star with a higher mass galactic core, where the low mass mother star orbited the core briefly before coalescing and triggering the outburst. So where does the energy come from? The answer is very simple — the exponential increase of genic energy which would occur at the time of coalescence. Subquantum kinetics states that genic energy output of a celestial body is directly proportional to the depth of its G-well and also proportional to the thermal energy of the body. At the time when the two bodies coalesced, their combined G-well would have been much deeper than the G-wells that existed prior to coalescence. Also the kinetic energy released at the time of coalescence would have caused the energy content of the combined mother stars to sky rocket. The sudden rise of photon energy causes a sudden rise in the rate of genic energy production, which in turn causes the energy density within the star to increase exponentially. This vicious circle leads to an explosive outburst of genic energy in cases where the generated energy cannot leave the core of the mother star sufficiently quickly. This energy essentially comes into being spontaneously, and is perfectly plausible in subquantum kinetics, since subquantum kinetics postulates that the universe we live in functions as an open system in which energy may be continuously be created due to underlying primal ether flux that energizes and sustains our universe. So there you have it, the gamma ray burst was no mystery at all, but was entirely expected. Please stop talking about black holes. Modern mainstream scientists are so stupid and uninformed. As per the works of Dr. LaViolette, there is no such thing as a “Black Hole.” Anyone who doubts this fact needs to read both Subquantum Kinetics and Earth Under Fire. In reality, you only have closely packed neutrons in mother stars producing energy and mass from the 5th dimensional universe. Our sun and earth are slowly growing because of this energy. Ultimately the sun will become a blue giant and the Earth will become a gas giant. It is just a matter of time. 1- Just wondering how much of Wal Thornhill’s work (Build upon Velikovsky’s) fits in with yours? 2- Wouldn’t it be nice to get some crowdfunding going to do further experiments on building antigravity machines? Their desperation is so strange. I’ve also not been able to get updated cosmic ray info. Hasn’t posted an update from earth to sky calculous, in awhile. OK, so good Dr. could you tell me what side of the Wall are we on and what this is all about? I would tend to think we are the Barbarians someone wants to keep out. “”Dark Flow” sounds like a new SciFi Channel series. It’s not! Back in the Middle Ages, maps showed terrifying images of sea dragons at the boundaries of the known world. Today, scientists have observed strange new motion at the very limits of the known universe – kind of where you’d expect to find new things, but they still didn’t expect this. A huge swath of galactic clusters seem to be heading to a cosmic hotspot and nobody knows why. The great wall is a massive array of astronomical objects named after the observations which revealed them, the Sloan Digital Sky Survey. An eight year project scanned over a quarter of the sky to generate full 3-D maps of almost a million galaxies. Analysis of these images revealed a huge panel of galaxies 1.37 billion light years long, and even the pedantic-sounding .07 there is six hundred and sixty billion trillion kilometers. This is science precisely measuring made-up sounding numbers. This isn’t the only wall out there – others exist, all with far greater lengths than width or depth, actual sheets of galaxies forming some of the most impressive anythings there are. And these walls are only a special class of galactic filaments, long strings of matter stretched between mind-breaking expanses of emptiness. I discuss walls and cosmic voids in the book Subquantum Kinetics. These recent findings only further indicate the invalidity of the big bang theory and further support subquantum kinetics which easily explains how these large super galactic structures are formed. The most interesting part is that there are implications for finding messages from other advanced extraterrestrial civilizations through the method of propulsion! Please let us know your opinion. Seem to be rather primitive space drives. I doubt that ET’s would be using these. What about Dec 27th, 2004? Thought this might interest you Sir. I didn’t know were to place this. Nor what to really think about it? Sounds plausible thin though? Well such as Physics, in explaining the cosmos, it’s be done alone. Chemistry of the cosmos never really gets much attention. But now a fifth dimensional black ring / naked singularity? Edit: it can’t be done alone. I’ve heard that several disciplinary studies of science are doing a tremendous amount of data cross referencing. Perhaps anomalies will start getting explained far quicker in the not to distant future. I’m seeing a culmination of many valid arguments finding a common answer to so many questions posed. So much fighting and leaning upon what is current belief among constant stress to get funding. It is time for the Mavericks of science, who have been silenced by agendas of money, and of evil to be heard. For “Pseudo Science” is far more plausible than the Psy Ops for blindly lead waste, and destruction. For what is Pseudo but unproven, esoteric, and unimagined arguments. Carl Segan, would be proud. The possibilities that naked singularities could form in a stellar collapse to a singularity state is a proof that black holes do not form. For a naked singularity would dump an infinite amount of energy into the universe thereby destroying the universe. The fact that we are here discussing this indicates that naked singularities have not formed and that collapses to black hole singularities do not take place. As Cornell University physicists showed some 30 years ago, most stellar collapses would result in naked singularities, hence the impossibility for a stellar core to reach the singularity state. Thank you so much for coming out on this matter. “A brilliant burst of gamma rays may have caused a mass extinction event on Earth 440 million years ago—and a similar celestial catastrophe could happen again, according to a new study. Most gamma-ray bursts are thought to be streams of high-energy radiation produced when the core of a very massive star collapses. The new computer model shows that a gamma-ray burst aimed at Earth could deplete the ozone layer, cause acid rain, and initiate a round of global cooling from as far as 6,500 light-years away. Such a disaster may have been responsible for the mass die-off of 70 percent of the marine creatures that thrived during the Ordovician period (488 to 443 million years ago), suggests study leader Brian Thomas, an astrophysicist at Washburn University in Kansas. The simulation also shows that a significant gamma-ray burst is likely to go off within range of Earth every billion years or so, although the stream of radiation would have to be lined up just right to affect the planet. Currently WR104, a massive star 8,000 light-years away in the constellation Sagittarius, is in position to be a potential threat, Thomas noted. But the study, which has been submitted to the International Journal of Astrobiology, isn’t necessarily sending other astrophysicists into a panic. Thank You very much for the explanation and for real scientific, brilliant and breathtaking theory you have created. When I was reading “Subquantum kinetics” I was so happy, I was in highly elated state (repeating your statement about the state of the mainstream physics community after announcement of the Detection-Resurrection of the waves of gravity or Higg’s bossons). It was the Physics that I was looking for long time since I had understood falsity (or, my be, fraud) of the theory of relativity. First time in my life I saw so beautiful, complete, closed, and, what is most important, conscientious, sincere and straight theory of the Universe. Theory is too beautiful not to be true. My feelings and intuition say to me that You have penetrated the Truth. Thank You very much for your Work once again, and let’s God bless You. ….But now it seems that collision may have been followed by a bright burst of gamma rays. NASA’s Fermi gamma-ray space telescope detected such an eruption just 0.4 seconds after LIGO’s gravitational waves arrived at Earth. It’s not clear whether the same event triggered both signals, but the Fermi team calculated that the probability of a coincidence was just 0.0022. The problem is that no one expected such a bright gamma-ray burst to accompany a black-hole merger. Coalescing black holes orbit each other in a cosmic do-si-do, clearing out a region of empty space. According to models of gamma-ray bursts, isolated black holes can’t ignite them. Very interesting. The explanation that is offered for this–two black holes spiraling within a huge star, then coalescing into one, then triggering the star to collapse and go supernova–shows how far out these explanations can get. The truth is that the explanation that I presented here of two stars coalescing would have resulted in a supernova outburst at the moment of coalescence. So no fancy band aid explanation is needed. Looks like I will have to update the posting. It seems to me the BH community, and the sheeple that follow it. Well… they don’t like the fact that the predictions for what would be discovered, is not about BHs. Einstien would rolled over in his grave, if he caught wind of this. Ooow! We can see the reason for gravity waves they say… the cosmic dust of the galaxy moved.???? Yet how do they explain where the dust suddenly went? Why was the dust surrounding this galaxies core to begin with? They refuse to accept constant cosmic creation. I’m being hammered over sharing your works Sir. But i believe it is worth it. Because these sucubbi of science, have already stolen your work, piece by piece, for the better part of two decades. They don’t like being called out, even when they put words in the mouths of dead scientists. I’ve done every thing i can to find any new IR images of our galactic core, from the WISE satellite, the one the Vatican launched in 2013ish? My internet connection is quite terrible. But i’ll scour the weds for piecies, and plagerism attempts by MSS. Something, imho, is a miss. Dr. LaViolette, great to see you back in activity and with interesting things to report! I have a question: when looking at the recent http://www.swift-sgra.com chart, the measurement seems off the scale. Any idea what is going on? Thank you very much for your explanation. Saludos. Earth Under Fire showed that gravity waves travel superluminally (at least at first, right after they are generated).. The Podkletnov experiments as well as the numerous major earthquakes observed a few days before 2004 gamma ray burst provide ample proof of this. What LIGO measured was a gravity wave traveling at the speed of light. While some gravity waves could travel at the speed of light, these gravity waves measured by LIGO are probably not the same, maybe much more powerful gravity waves that travel superluminally. No, the signal time delay between the two gravity wave antenna indicated that the wave traveled at essentially the speed of light. The detectors were 3000 km apart and the signal delay was 0.007 seconds. So, if the wave by chance traveled in line with the detectors, it would have been traveling at 1.4 c. But more likely it came in at an angle to the plane of the detectors. Assuming a speed of 1 c, it would have made an angle of about 45°.